Latest PostsSiding: Repaint or Replace? Qualities of ENERGY STAR®-Qualified Replacement Windows 5 Home Additions That Can Increase Your Home’s Value Different Types of Exterior Additions How Do Metal Roofs Stand Up to Hailstorms? After some research and, hopefully, after getting a few ideas from the first two parts of this blog series, you can probably better visualize your home’s exterior with its new siding. However, before you can finally enjoy looking at your upgraded home, you first need to ensure proper and high-quality siding installation. How? By choosing and hiring the right siding contractor. Here now are some tips to help you find a contractor who’s is worth your time, trust, and business. Ask for copies of business permits and their contractor licenses – You need to know if you’re dealing with a legit contractor who is authorized to perform contracting work and operate a business in your area. Ask for proof of manufacturer certification – Manufacturers like James Hardie™ and Ply Gem certify qualified contractors to offer and install their products. When a contractor is manufacturer-certified, you’d know that they have sufficient knowledge and training in handling the products. Ask for customer references – Happy customers mean that the contractor was able to provide them with top-notch service. Ask about their insurance coverage – Working with an insured contractor gives you the peace of mind that you can only truly enjoy when you are covered for any liabilities and problems that might arise while the project is ongoing. Ask about product and labor warranties – Siding products usually come with extensive warranties. Ask the contractor about them and find out if they also offer workmanship guarantees. Ask about their work process – You’d want to know what level of service you can expect from the contractor. Knowing their work process will also help you better prepare for the project. Siding replacement is a home improvement project that can tremendously impact your home. By knowing what things to consider, you’ll definitely have a hassle-free and fulfilling experience. 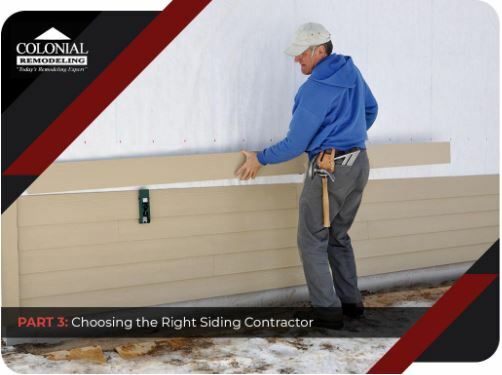 With the help of a reliable siding contractor, you will know which products will work best for your home. You’ll also be assured that the products will be installed properly and according to manufacturer and industry standards.